It took Mama II awhile to complete this nest, but she finally did on 25 March. I thought she might lay an egg yesterday because she was in the box a long while in the morning, but that didn’t happen. 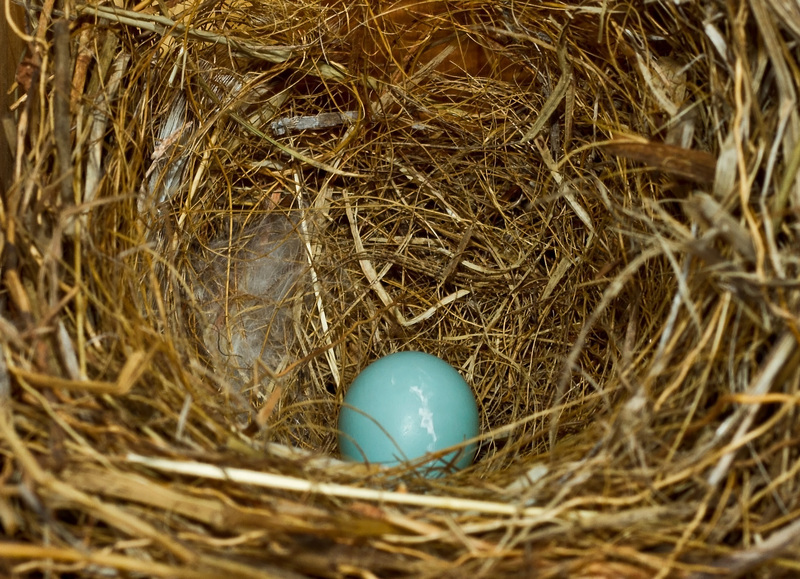 Most bluebird eggs are laid in the morning. Today I went out and discovered our first bluebird egg of the season. Now that egg laying has begun, Mama will probably lay an egg a day until she completes a clutch of 4-6 little powder blue eggs. Sometimes if a cool front comes through bluebirds will skip a day. I won’t be around to chronicle every egg because Carolyn and I are headed to High Island, TX for the neotropical migration. I’ll post a set of photos on my flickr account at http://www.flickr.com/photos/reddirtpics/ Hopefully we’ll get some good shots to share. A rough estimate of hatch date is around April 15, based on an egg a day for five days and a 13-day incubation period. We’ll return home before that date and be here to watch the first chick emerge. 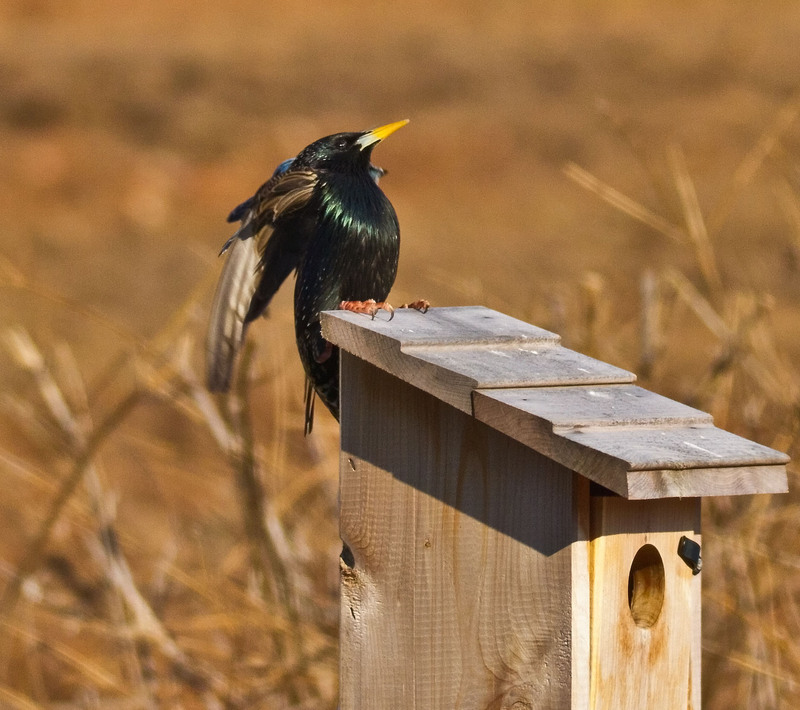 Photo is Mama striking a starling perched on her nestbox. Her wing is visible on the left of the starling and her beak just peaking out on the right. Click to enlarge. If you have a bluebird box without a baffle, please install one before there are babies in the nest. Snakes have an uncanny ability to locate baby birds and boxes without baffles suffer high mortality. Spring is also gardening time, if you don’t have some shrubs that bear berries, it’s a good time to plant some. Bluebirds eat berries in the winter and if you don’t have some, your bluebirds will be forced to leave your property in winter. Nothing to do with bluebirds, but it’s also time to hang hummingbird feeders. I guess I’ll see my first of the season on High Island. Total bluebirds fledged from this nest site since 2009 is 49. Lindell Dillon is retired and lives in Norman, OK. He grew up in Duncan, attended Cameron College and graduated from the University of Oklahoma. His interests include photography, nature, birding, and investing. Oklahoma Master Naturalist, alumnus and board member Norman Police Department Citizens Academy. My bluebirds finally picked a box and started building a nest, but a cold front (low in 20’s) came through. I hope they come back to finish it and don’t abort it. Also, I have a new pesky mockingbird in the cleyera behind my box. Is this going to be a problem when the mocker lays eggs? I know how territorial they are? I’ve never had a problem with a mocker and the bluebirds. One year their nests were really close. Mama laid her second egg yesterday. I installed the Sparrow Spooker and left for Texas. The bluebirds are without their security guard and caterer for awhile.